Dolls play a very versatile roll in the playroom covering roll play, partnership, friend, and snuggle buddy. 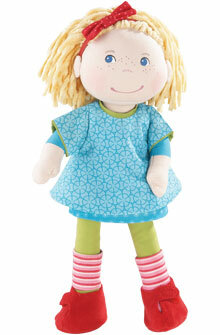 HABA and Kathe Kruse dolls are designed to be played with and loved. HABA dolls have soft bodies with interchangeable outfits. HABA dolls come in various sizes - make sure your outfits are the right size to fit your doll. Weight has been added to the HABA dolls to give a more realistic feel. Kathe Kruse is best known for their Waldorf dolls. Kathe Kruse has been making dolls for over 100 years. All Kathe Kruse products are designed in Donauwoerth, Germany and 90% of their toys are still made in Europe.